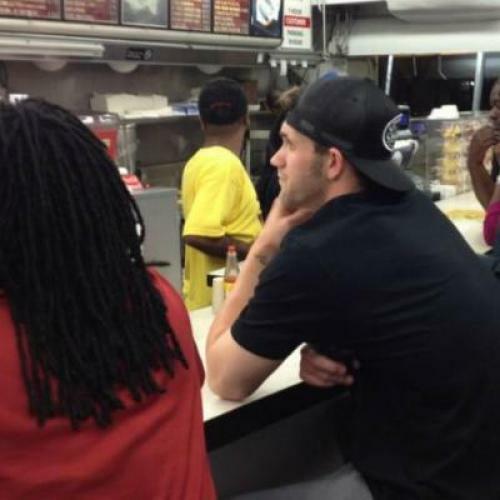 Earlier this week, pictures surfaced on Twitter of Bryce Harper, the Washington Nationals’ charismatic rookie outfielder, and Wale, D.C.’s trademark rapper, at Ben’s Chili Bowl, the iconic U Street totem to Chocolate City that famously encourages President Obama and Bill Cosby to eat for free. I retweeted a picture of Harper and Virginia Ali, Ben’s Chili Bowl’s Founding Mother, obliquely noting my distant, personal connection: that she sent her sons to the same high school from which I graduated. I may not be able to enjoy Ben’s famous half-smokes (I don’t eat pork), and, more to the point, I may not have lived in D.C. for almost a decade. But I wanted my taste. The Ben’s outing was freighted with symbolism. Since I left D.C. for New York City in 2003, its historically black neighborhood has gentrified significantly. Nearby streets where I would not have even considered walking when I was a kid are now where many of my friends live. Another thing that happened since I left D.C. is that, in 2005, D.C. got a baseball team. Last night, the Washington Nationals clinched at least a wild card spot (they are in the lead for the National League East title), becoming the first D.C. baseball team to qualify for the playoffs since 1933. Perhaps you understand how hapless Washington baseball has been. The old Washington Senators won one World Series, in 1924, and appeared in only one more. When the writers of the musical Damn Yankees needed a hapless foil to the dominant Bronx Bombers, they of course chose the Senators. And then, as if being bad weren’t bad enough, D.C. lost its baseball team twice: first in 1960, when they moved to Minnesota and became the Twins; and again in 1971, when the second Washington Senators franchise became the Texas Rangers. And then, as if that weren’t enough, when D.C. finally did get its own team, it was the Montreal Expos, another good-for-nothing ballclub. Until this year, the Expos-Nationals have sustained the longest current postseason drought of any Major League franchise. Because my father is a native Washingtonian, the loss of the Senators was a part of my memory and the absence of a team a part of my consciousness. So even though I'd left town before the Nats even arrived, it seemed natural that I would begin to root for them. What was less predictable, though, was how involved I would become in the fortunes of a team with which I'd never actually shared a city. As I became more ensconced as a New Yorker, it seemed, my second-order allegiance to the idea that D.C. is my hometown had grown stronger. And the most obvious way to proclaim this allegiance was through vigorous root, root, rooting for the home team. Here’s the truth about New York: It belongs to everyone, which means that at the deepest level it also belongs to no one (including the natives). This is why New Yorkers love it and/or grow addicted to it: the sense of cosmopolitanism, of ambition and meritocracy uninhibited by tribal allegiance, is unsurpassed, and for a certain type of person it is the only way to live. Yet contrary to news reports, New Yorkers are also human beings, which means we do not lose our need to feel like we are part of something bigger than ourselves, to proclaim an exclusive identity to the world. For me, that has involved being a Washingtonian (and, when I prefer, a suburban Marylander) in New York. How to express this identity? On gamedays, Gotham is full of expatriate Pittsburghers in their Steelers gear and long-lost Chicagoans cheering the Cubs. A team that’s existed for less than a decade–and been putrid for most of that time–has fewer long-distance devotees. But here I am, flying the flag by tweeting updates on Nats games as I listen to them through MLB.com. I hope that doesn’t sound too cynical. I really have fallen in love with this team: Gio Gonzalez’ perennial smile and Ryan Zimmerman’s swagger; Ross Detwiler’s frat-boy affect and manager Davey Johnson’s ancient-mariner aspect. And, of course, Harper, who in his first games in the spring resembled nothing so much as a puppy testing the limits of his own body (stealing home! ), but who has graduated, after a protracted slump, into an important contributor to the team with the best record in the major leagues. Really, I’m not all that different from Wale. He was born in D.C. (although he spent much of his childhood in Montgomery County, like me), and I’m sure he has great love for the place. But his first single was called “Chillin’,” as in, “D.C. chillin’,” for which the music video was shot at Ben’s; I once saw him rap it at halftime at a Redskins-Cowboys game, where he wore the jersey of Sean Taylor, the Redskins safety who was murdered several years ago and whose burgundy-and-gold #21 can be found in many a Redskins bar. He gets money out of his self-branding, and I get something almost as satisfying. So it turns out that Harper and Wale’s impromptu appearance at Ben’s was actually organized by the Bristol Behemoth itself, ESPN. Should I care? I still got to see pictures of them munching chili dogs, and that’s the most I’m prepared to ask of sports right now. Maybe next month I will get a little greedier, and ask for the World Series.